Blair Fox Cellars sources from only the most exceptional vineyards in Santa Barbara County. With meticulous canopy and crop management these vineyards create the highest quality grapes that can be bottled under independent vineyard designations such as: Paradise Road Vineyard; Purisima Mountain Vineyard; Thompson Vineyard; Tierra Alta Vineyard and our Estate Vineyard, Fox Family vineyard. The Paradise Road Vineyard is the eastern most vineyard in Santa Barbara County. It experiences a much warmer climate and located at a much higher elevation than most other Santa Barbara County vineyards and possesses red, iron rich, nutrient deprived soils. This results in tiny berries, small clusters and very concentrated flavors for both the Syrah and the Viognier varietals grown on this wonderful vineyard. 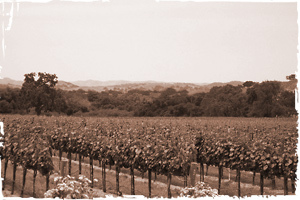 The Purisima Mountain Vineyard is located in the Ballard Canyon area of the Santa Ynez Valley. This vineyard is owned by the Beckmen family and produces some of the best Rhone varietals in Santa Barbara County. Most of this vineyard is grown on hillsides, in a Biodynamic manner, so a great amount of effort and expense is put forth to make sure the fruit is of the absolute highest quality. Thompson Vineyard is located in Los Alamos off Alisos Canyon Rd. We were fortunate enough to contract fruit for 2007 and will continue to contract fruit for as long as possible. This vineyard produces some of the most beautiful and concentrated fruit I have ever worked with. My grapes come from the old section of the vineyard just down from Ojai and Jaffurs and just above Copain and Tensley. Tierra Alta Vineyard is located a few hillsides over from Purisima Mountain in the Ballard Canyon area of the Santa Ynez Valley. The Syrah grapes from this vineyard are sourced from a very steep hillside block of Clone1 planted in shallow calcareous soils. This vineyard produces bright, concentrated wines with dark chocolate, white pepper and spice. The Fox Family Vineyard is a small, organic vineyard in the hills of Los Olivos planted to Syrah, Grenache, Petite Sirah, Zinfandel, a small amount of Vermentino and farmed entirely by hand. This vineyard is planted on extreme hillsides with rocky, nutrient poor soils, perfect for quality grape growing. This is our estate vineyard and every vine is meticulously cared for! Taste these vineyards in our wine!